Every season is busy season for Believe In Tomorrow Children’s Foundation. 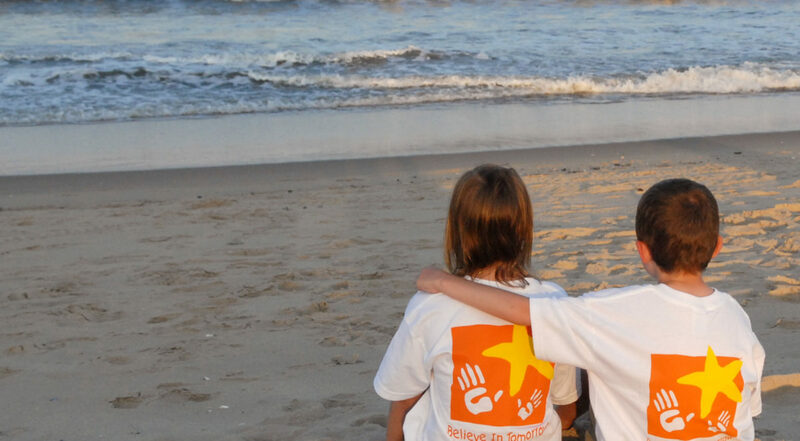 A nonprofit that provides beachside respite housing to critically ill children and their families, giving kids a place to be kids takes an inexhaustible amount of fundraising and community support. Luckily, the staff and volunteers with Believe In Tomorrow, and the Ocean City community as a whole, care a lot about the cause. There are currently two houses that host families in Ocean City. The flagship location is known as the Believe In Tomorrow House by the Sea, a multi-unit, oceanfront respite house on 66th street where whimsical beach decor and colorful murals give a unique personality to each and every room. The Believe In Tomorrow House on the Bay, down on 28th Street, is a two-story bayside condo designated for critically ill children from military families, through the foundation’s Military Initiative. Between the two houses, as many as six families can stay each week. Both houses are always packed with kids during the summer, and continue to see a steady flow of families even through the colder off-season months. Soon, a new house will be added to the lineup, a classic beach cottage that the foundation recently purchased, then had to tear down completely due to unanticipated structural problems. They hope to have a new house built by summer, this one to host terminally ill children and their families as they near the end of life. Wayne Littleton is the program manager for Ocean City’s Believe In Tomorrow houses, and even when the shoulder season casts a quiet shadow over town and families are back to work and school rather than vacationing on the beach, he and his volunteers stay involved with families and fundraising events all year long. During the summer, a typical week at the respite house is packed with the usual Eastern Shore family vacation activities and fare. Families check in on Sunday night, and convene on Monday for a meet-and-greet barbecue on the deck. Local restaurants, like Smoker’s Barbeque and Martin’s Fish Co., donate food, and volunteers with the foundation bring some of their own homemade dishes. Families and volunteers eat and play games, and those under 18 can sit at a handbuilt tiki bar that’s just for kids only, no parents allowed. On Tuesday nights they’ll all head to Hooper’s Crab House and eat crabs on the bay. On some days they’ll hit the rides at Jolly Roger, and on other days the older kids will ride Segways through town. They’ll go out on private boats and learn how to fish from retirees in Ocean Pines, who volunteer their time to taking families out and giving them a tour on the water every week. They might even stop by 98.1 The Beach, the local radio station that broadcasts out of Seacrets, where Bulldog and his crew invite the kids to come by and talk about how their vacation’s been going. For many of them it’s their first time in Ocean City, and they have a lot of new experiences to talk about. Families come to the respite house when they have a child who’s critically ill. Life can change drastically when a child has been diagnosed with a major illness, but the foundation provides a little bit of fun and, what might be even more important, a little bit of normalcy, if only for a week. At the house, no one asks the child what they’re sick with — they’re just there to have a good time at the beach with their family, no questions asked. In many cases, their Ocean City vacation looks exactly the same as any other child’s. To make their vacations especially memorable, Littleton has learned to send out questionnaires beforehand, to give him a sense of each child’s likes and dislikes. Most families come from mid-Atlantic states, but anyone can join the program. One family came from Minnesota, he remembered, and they didn’t seem to be beach people, staying inside and wearing jeans and long-sleeve t-shirts in the 90-degree July weather. He could tell that this child, a 17-year-old girl, wasn’t having a good time, until he realized where her interests lied. Other times, it can be more difficult to figure out what will bring a smile to a child’s face. Often, it’s the community, and meeting other children and families in similar situations, that makes all the difference. Littleton recalled the night that a volunteer, Ms. Pat, came into his office crying after overhearing a conversation between two young boys. “We had two little boys around the same age sitting at the craft table, and the one little boy would not talk the first few days he was here. Wouldn’t say a word, just mad I guess, because he had cancer,” he said. Summers are busy, and winters aren’t as lined up with events and activities, but families do continue to come for the week. They eat at restaurants, stroll the boardwalk and tour Winterfest of Lights at their own leisure. The rooms are decorated for Christmas, and presents are placed under Christmas trees. Meanwhile, Littleton and his staff of volunteers and philanthropists are in the throes of planning their biggest event of the year: Prom Night. Everyone’s invited to get down and boogie at the grooviest party of the year, so long as they don their best bell bottoms and platform shoes, and enjoy dinner and dessert, plus happy hour pricing, all night long. The Prom King and Queen will be crowned after their months of tireless fundraising. The prom court — which usually consists of five women and five men — hold events throughout Ocean City that lead up to Prom Night, and every dollar each individual raises equals one vote cast in their favor. Last year, the prom court raised over $100,000 for the foundation. This year, the goal is $125,000. Breakfast with Santa at Pickles Pub: Dec. 8, 9 – 11 a.m. $10 donation for breakfast, arts and crafts, and a photo with Santa. Ugly Sweater Night at 28th Street Pit & Pub: Dec. 14, 7 – 11 p.m. $10 crabcakes all night, $1 of every cocktail, wine and beer donated to The Children’s House by the Sea. Featuring an ugly sweater contest, raffles, tricky tray, 50/50, and a silent auction, plus the prom court as guest bartenders. Polar Express Movie Experience at Dunes Manor: Dec. 16, 4 – 6 p.m. and Dec. 22, 6 – 8 p.m. $5 donation, reservations are required. Wear your pajamas and watch The Polar Express. Hot chocolate and cookies will be provided by Santa’s elves, and Santa will make a special appearance and hand out gifts to all who believe. For those who may not be interested in being Prom Queen but still want to volunteer with Believe In Tomorrow, Littleton says all they have to do is come and talk to him. Between individual volunteers and local businesses who volunteer their food and their space, he says he’s been surprised by all the support he’s seen over the years. The examples he rolls off seem to be endless. There’s Hooper’s, where owner Pete Shepard has been donating crab feasts to families for decades, and even installed the town’s old coin-operated parking meters at Sneaky Pete’s to take donations for the foundation; Sunset Grille owner Buddy Trala, who’s always lending a hand and an entree; Restaurants like the Pit & Pub and Seacrets, where they “never say no” to hosting an event or helping collect donations; countless other year-round businesses that find their own special ways to give back to the community and the kids who visit it; and individual acts of kindness, too. Like the waiter who was given a tip by one of the visiting families, who came by the house a week later to donate the very tip he’d received.